ActiveLegal - Advice for dealing with the police. What it helps to know. The Main Rule: Don’t make any statements to the police … Ever! 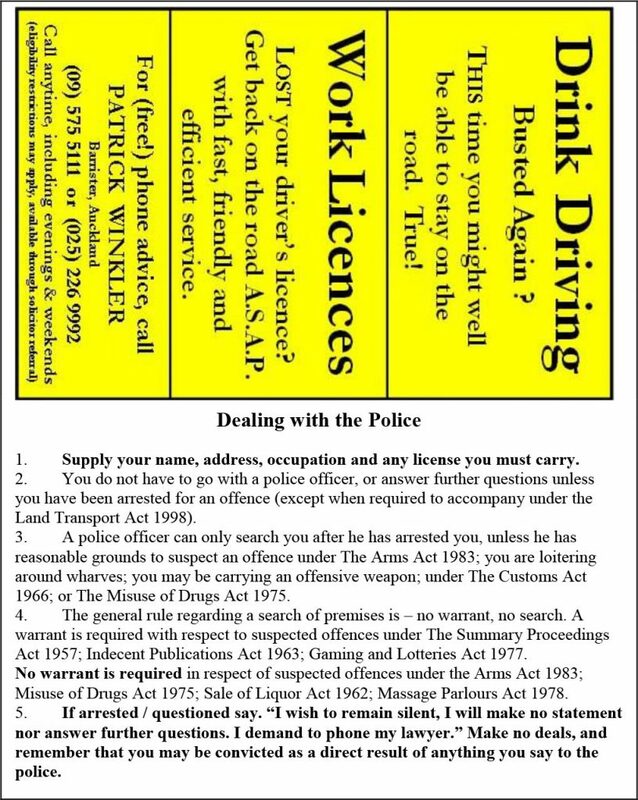 Supply your name, address, occupation and any licence you must carry. You do not have to go with a police officer, or answer further questions unless you have been arrested for an offence (except when required to accompany under the Land Transport Act 1998). A police officer can only search you after he has arrested you, unless he has reasonable grounds to suspect an offence under the Arms Act 1983; that you are loitering around wharves; that you may be carrying an offensive weapon; or under the Customs Act 1966; or the Misuse of Drugs Act 1975. The general rule regarding a search of premises is – no warrant, no search. A warrant is required with respect to suspected offences under the Summary Proceedings Act 1957; Indecent Publications Act 1963; Gaming and Lotteries Act 1977. No warrant is required in respect of suspected offences under the Arms Act 1983; Misuse of Drugs Act 1975; Sale of Liquor Act 1962; Massage Parlours Act 1978. If arrested/questioned say: “I wish to remain silent, I will make no statement or answer further questions. I demand to phone my lawyer.” Make no deals, and remember that you may be convicted as a direct result of anything you say to the police. So that you have this information when you need it, click on the image below. And remember the main rule: Don’t make any statements! (By the way – everything except your name, address, occupation and date of birth is a statement). The image links to a PDF document. Click the image, save the document to your computer, and then print out the wallet card. Keep your wallet card with you for when you need it.